The bull market that started in early March 2009 will very likely continue for at least another 12 to 15 months. We're probably at the 2/3 point of this powerful run; and before this is all done odds are good that we see SPX in lower 1800's. Like every bull market before it, there has been and will be short periods of consolidation when Market needs to stop, retrace and undergo a healthy correction. Those consolidation / correction periods can be short or long depending on what has just taken place or about to take place. For a bullish event, successfully crossing 200 W-SMA in late October 2010 for example, SPX corrected a few percent in a few weeks. 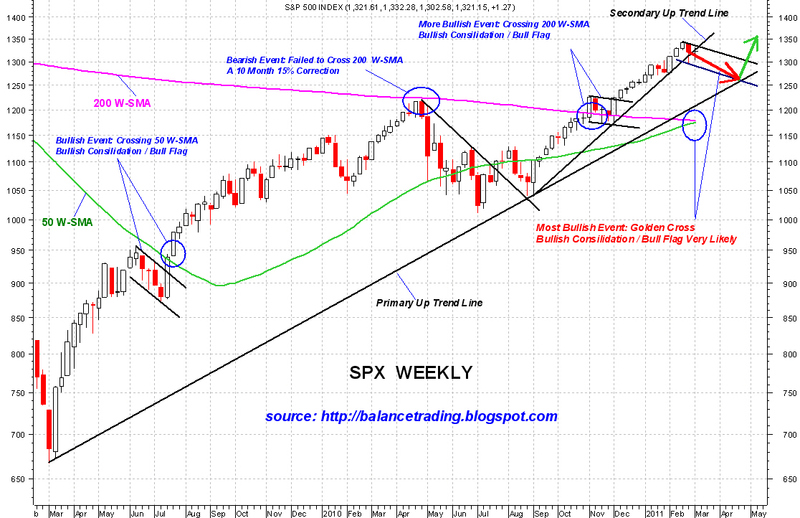 For a bearish event, failing to cross 200 W-SMA in late April 2010, SPX underwent a 10 month 15% correction as a punishment. 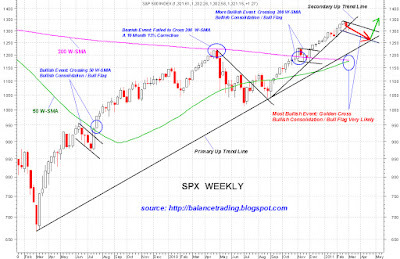 As show on the chart above, SPX is about to experience one of the most bullish events: A Golden Cross on its weekly chart. Accompanying this most bullish event, there would be a short consolidation / correction period. I believe that consolidation period has started for SPX. I believe SPX continues to correct for a brief period until mid to late April when SPX would successfully test its primary uptrend line on its weekly chart at or around 1250 before resuming its rally once again. Important Note: A heavy, solid and confirmed close above SPX recent high of 1344 signifies the end of current consolidation / correction phase.